Dolce & GabbanaDolce & Gabbana Light Blue Eau De Toilette Spray, 3.3 Oz. A stunning perfume, overwhelming and irresistible like the joy of living. Evokes the spirit of Italy, the infinite sky, the deep sea and lighthearted joy. Surprising and colored: the liveliness of Sicilian citron, the happiness of Granny Smith apple, the spontaneity of bluebells. Feminine and resolute: the intensity of jasmine, the freshness of bamboo, the charm of white rose. Deep and true: the character of cedarwood, the fullness of amber, the embrace of musk. 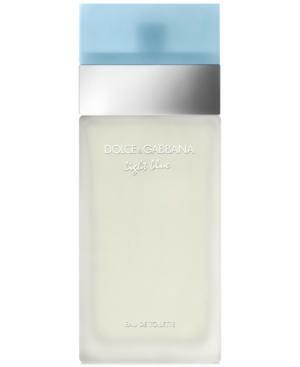 Dolce & Gabbana Light Blue Eau De Toilette Spray 3.3 Oz. Dolce & Gabbana Light Blue Italian Zest Pour Femme Eau De Toilette Spray, 3.3-oz. Dolce & Gabbana The One Eau De Toilette Spray, 3.3 Oz. Dolce & Gabbana Light Blue Eau De Toilette Spray, 1.6 Oz. Nina L'air Du Temps Eau De Toilette Spray 3.3 Oz. Dolce & Gabbana Light Blue Eau De Toilette Spray, 6.6 Oz. Dolce & Gabbana Light Blue Eau De Toilette Spray, 6.6-oz. Hermes Eau Des Merveilles Eau De Toilette Spray 3.3 Oz.